What if we treated every man who wants to buy a gun like every woman who wants to get an abortion? We’d require a mandatory 48 hour waiting period, parental permission, a note from his doctor proving he understands what he’s about to do, and a video he has to watch about the effects of gun violence. Then we’d close down all but one gun shop in every state and make him travel hundreds of miles, take time off work, and stay overnight in a strange town in order to get a gun. He’d have to walk through a gauntlet of people holding photos of loved ones who were shot death, hear people call him a murderer begging him not buy a gun. It makes more sense to do this with men seeking guns than with women exercising their reproductive health care rights. No woman getting an abortion has ever killed a room full of people in seconds. *Distilled from the writings of William Hamby. Again. This time, the scene was a community college in Roseburg, Oregon, 175 miles south of Portland. This time, nine people were murdered and the shooter committed suicide. This time, President Obama spoke out more forcefully than he did after Sandy Hook. This time, stronger alliances are forming to lobby Congress to pass stringent new gun laws. This time, there are louder calls to improve services for the mentally ill. Here is one thing not happening this time: the shooter’s gender is not central to the story; is not the big news. This time, few are demanding we start taking seriously the fact that the shooters are always men. That has to change. Activist-colleagues and I have written tens of thousands of words in scores of op-eds and blog posts going back to before Columbine. And those killings happened in 1999. Our message could be boiled down to a single phrase: “It’s the masculinity, stupid.” We cannot afford to wait another minute to move the gendered aspect of mass killings to the center of the national debate. In recent years, the media has occasionally made note of the killers being male, and the topic of how boys are raised in this society made the news for a cycle or two. Then it has been back to gun control and mental health. Where is the sustained inquiry into how boys are socialized in deserts of emotional constriction? Where is the Frontline report on a society regularly producing crops of psychologically stunted, angry, isolated men? Where are the clergy sermonizing about men growing up in emotionally arid soil without exposure to the sunlight of compassion or the waters of connection? Imagine if things were different. Imagine if right now school nurses were charged with tracking moody eight- and nine-year-old boys; if homeroom teachers were trained to spot them as alienated middle schoolers; if guidance counselors identified shut-down high school age young men; if university health center staff counseled loner male college students; and if community social workers and human resources staff helped unemployed and underemployed 20-something at-risk men. Imagine all of those groups working with nurses, doctors, and mental health professionals in a coordinated campaign at the Centers for Disease Control. Isn’t this particular strain of men’s violence a public health crisis the CDC should confront as seriously as it did the Ebola outbreak? If we take all these steps, our hazy, confused picture of sad, angry, lonely young men will come into sharp relief and we will recognize we have to begin cultivating boys’ emotional intelligence beginning in preschool—and we have to make doing so as high a priority as we make teaching reading and math. Our vision will be so clear we will be able to see inside troubled men’s souls before their time bombs of discontent explode. Here is the hard part. Even if a critical mass agrees with this analysis, how are we going to effect change? As important as curbing access to guns is, lobbying Congress for stricter gun laws will never be enough. Nor will securing additional funds for mental health services, as vital as those services may be. President Obama is right: it’s up to individual citizens to band together to put pressure on Congress. But he hasn’t gone far enough: he hasn’t uttered the “M” word. That’s okay; that’s our job. As Gandhi taught us: when the people lead, the leaders will follow. Since men are perpetrating these mass killings, it’s only right that we men are our brothers’ keepers, working to prevent our brothers’ violence, beginning with promoting efforts to raise sound boys and men. Our experiences learning from and collaborating with women and women’s organizations will be invaluable in all we do. Imagine if men across the spectrum band together in a Let’s Build Sound Boys and Men campaign working with early childhood educators, nurses and doctors, school administrators and counselors, parent-teacher organizations, and, especially, sports coaches—from those in weekend soccer leagues to Division I football. Former NFL defensive lineman Joe Ehrmann has been a driving force nationally, mentoring coaches by the thousands to guide boys to grow to become good men. Recently honored with a lifetime achievement award by representatives of several national men’s antiviolence organizations, and the NFL, Ehrmann believes what makes a good man is 1) his capacity to love and accept love and 2) being of service to his community. What better description could we ask men to consider at the outset of a new campaign to raise healthy boys? Mothers Against Drunk Drivers showed us what a force women banding together could be. Now it’s up to men—fathers, grandfathers, mentors, all males—to step up. What are we waiting for? Rob Okun is the editor of Voice Male, a national magazine chronicling the transformation of masculinities. 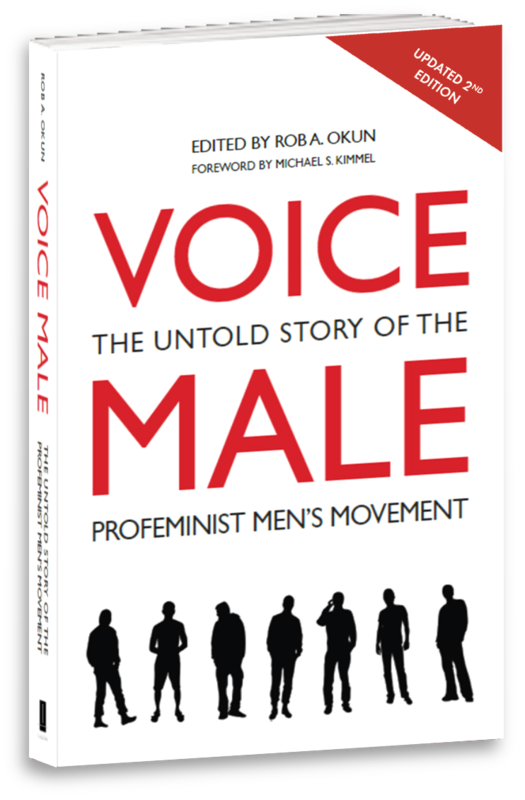 His anthology, VOICE MALE: The Untold Story of the Profeminist Men’s Movement was published last year. He can be reached at rob@voicemalemagazine.org.